From 22nd December 2015 there is a new Padang Besar Hat Yai Shuttle Train service in operation with two services a day in each direction. 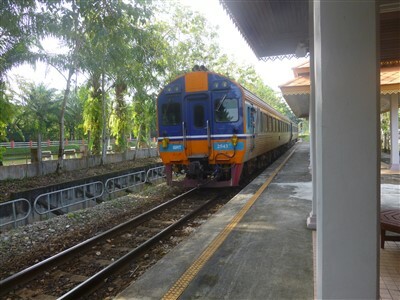 This new shuttle train between the border station in Malaysia to Thailand's southern city of Hat Yai, is a joint operation between the State Railways of Thailand (SRT) and Malaysian Railways (KTM Berhad). The train in use is an SRT Diesel Railcar (DRC), consisting of two air-conditioned carriages and able to accommodate a total of 168 passengers. Please note: These services have recently changed and services are now operated with at least four or five fan cooled carriages, which are able to carry far more passengers. 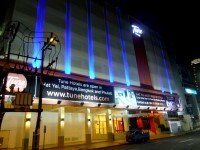 Consequently, it is now a little cheaper than it used to be as there is no air-con fee to pay. Times shown are in Thai time which is one hour behind Malaysian time. You can also take the Padang Besar to Bangkok train to Hat Yai, but it will be much more expensive (about 5 times as much), as you have to pay all the surcharges that are added to the normal ticket price for this special Express train. To get to Padang Besar railway station by train you can either take a long distance ETS service or a KTM Komuter service. Khlong Ngae and Padang Besar in Thailand, located just a few hundred metres from the Padang Besar Malaysia station. At Padang Besar Railway Station in Malaysia, there is border control for both Thailand and Malaysia. To check the latest departures time from the SRT website, see the link below the Pdg. Besar to Hatyai timetable above. Fares for this shuttle train now cost 50 Thai Baht in either direction and can be purchased from either station on the day of departure (no online booking is available). You can also pay in Malaysian money at Padang Besar Station if you don't have any Thai cash (but it is always best cheaper to pay in Thai Baht). If you are in Padang Besar station Malaysia, you will have to go to the State Railway of Thailand office to buy your tickets. Their office is located to the northern end of the platform as you come out of the immigration area. The office only opens for ticket sales between one and two hours before departures. Another way to travel between Padang Besar to Hat Yai is by local bus. The bus leaves from Padang Besar Thailand town and stops just across the road from the main land border crossing. If you are travelling from Malaysia to Thailand, you will have to leave the railway station (before going through border control) and walk across the walkway, over the tracks. The walkway is located upstairs, just next to the canteen. Once on the other side, turn left and you will see the Malaysian border control. Get stamped out of Malaysia, then walk up to the Thailand border control (5 - 10 minutes). Once you get your passport stamped into Thailand, the bus stop is just across the road to your right as you come out of the border control area. The bus fare from Padang Besar to Hat Yai is 44 Baht. This bus service stops at Hat Yai bus station, then goes into the centre of the city and terminates near the clock tower. There is also a minibus service between Padang Besar and Hat Yai bus station costing 50 Baht. This service leaves from the centre of town and is around 15 minute walk away from the border control area. If you want to go by minibus, you will have to walk into town or take a motor bike taxi. Turn left as you come out of the immigration area. Follow the road down the hill, cross the railway tracks, then turn left at the traffic lights. Walk along this road until you see a row of banks (they do currency exchange if you need it) - on your right is a convenience store "Fresh Mart". Turn right here - the minibus station is down this road on your right.